3 storey, newly completed intermediate terrace house. Price negotiable & renovation cost can be incl. 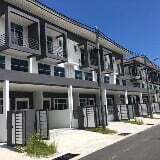 Villa Imbaan is located at Lorong Starland, Penampang (Next to KDCA). At traffic light after the Sur.